Fleetwood Windows & Doors has been a leading manufacturer of aluminum windows for Frontline Windows & More, Inc. for the past decade. Fleetwood Windows & Doors has been committed to manufacturing high quality, custom luxury windows and luxury doors, proudly made in the USA since 1961. Fleetwood’s modern innovation integrates contemporary architecture and technology, while retaining the simplicity of low-maintenance – a perfect choice for your replacement aluminum windows. Frontline Windows encourages you to explore Fleetwood aluminum windows if you are considering replacing or upgrading your current home windows. Fleetwood USA creates custom-made aluminum windows that stand out and step up to the next level of contemporary design. Currently leading the windows and doors market with the Greenest multi-slide and sliding pocket features in the United States, Fleetwood’s products are manufactured using recycled aluminum and glass and offered in various coatings and finishes. Fleetwood’s luxury windows are designed to be extremely energy efficient. With their NFRC and AAMA ratings and certifications they are a great option for use in your next window replacement project for any home striving to be energy efficient. Fleetwood’s windows have also proven themselves in the harshest of climates without sacrificing comfort. Their anodized finishes actually strengthen the aluminum, increasing both corrosion resistance and its aesthetic beauty. Durability – Aluminum frame windows are sturdy and strong enough to bear a heavy load with minimal reinforcement. Maintenance – Aluminum frame windows do not need painting and will not rot or warp. Reliability – If installed properly, an aluminum-framed window may last for the life of your home. 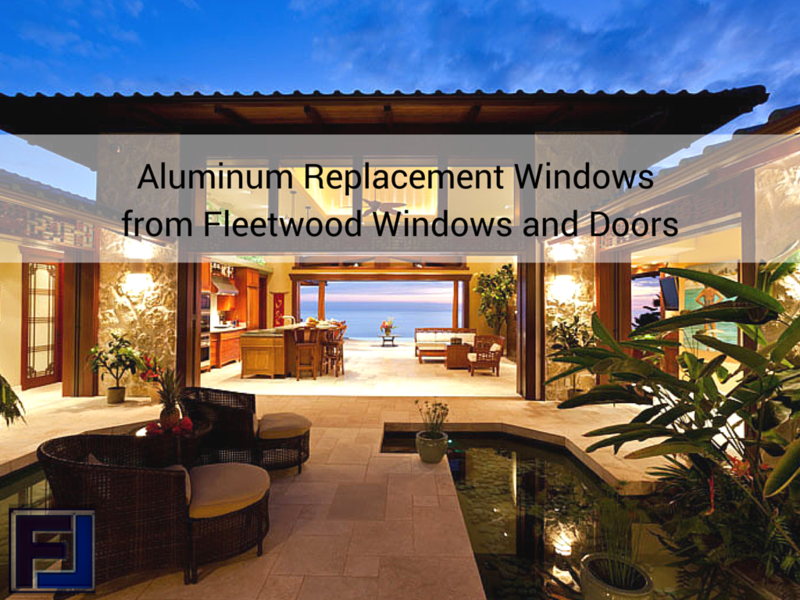 Choose Fleetwood for your window replacement project! Stop in our showroom, or contact us for ideas on how to use Fleetwood for your next project.